Are we talking of the same water flow and feeds? How is the Areni Water going to be sent to Sevan? From Ketchut dam, just south of Jermuk. The place where the Arpa-Sevan tunnel takes its inlet. Last edited by Vrej1915; 06-01-2012, 05:28 AM. A good case of disinformation by stupid ignorance or amateurism. 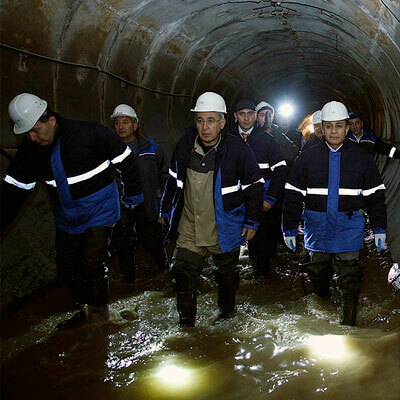 The second tunnel (Vorotan-Arpa), even if completed, never transported a liter of water to Sevan. 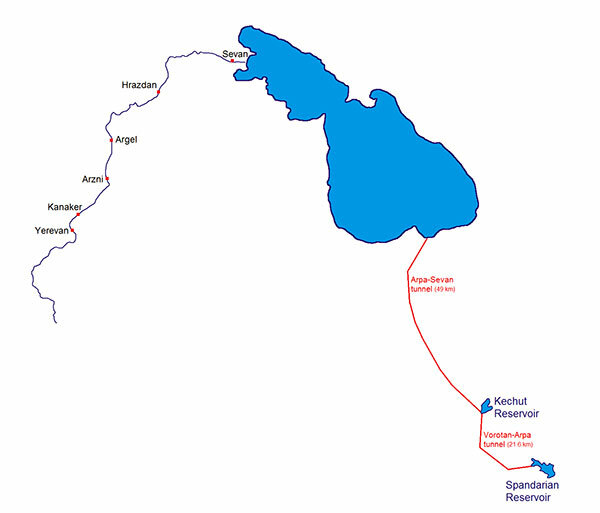 And as detailed above, part of the first's (Arpa-Sevan) capacity was diverted to Nakhitchevan for the sake of the regime mafia..
Lake Sevan is one of the few high-mountain fresh water lakes in the world. It originally had a surface of 1,416 square kilometers at an elevation of 1,916 meters (the second highest lake in the world after Lake Titicaca, on the Bolivia-Peru border, in South America). Only 1/12 of the more than 1,300,000 cubic meters annually entering the lake from rivers, streams, and precipitation flowed out through the Hrazdan River. The bulk of the entering water evaporated and vast areas of the Ararat plain remained unused due to the lack of moisture. 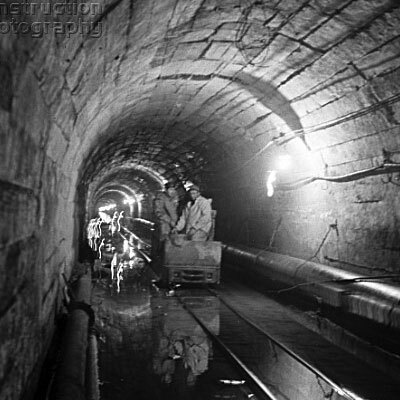 The tunnel during construction in 1973. The idea of increasing the outflow of the lake had been put forth since the beginning of the twentieth century. The free flow from the lake would increase more than six times if more than 80 per cent of the lake surface was drained. This would suffice to irrigate almost 250,000 acres of surface of the Ararat plain. The 1,000 meter drop between the lake and the plain would be used for the generation of electricity through the construction of a cascade of hydroelectric stations on the Hrazdan River. The work on the Sevan-Hrazdan irrigation-power complex, with six stations, started in 1933, in the period of rapid industrialization of the Soviet Union headed by Joseph Stalin. The first power station was opened in 1936. The complex was the only real source of power supply in Armenia, and until 1962 its hydroelectric stations generated almost 90 per cent of all electrical power in the country. However, the ecological condition of the lake underwent tangible changes and vast degradation due to reduced water level and detrimental impact of human activity on the biological diversity of the lake. Due to the water level decrease, the quality of the water deteriorated and natural habitats were destroyed. In the 1950s it had become evident that the ecological and economic consequences of extensive exploitation of the lake were too undesirable to continue in the same way. The interconnection of the power grids of Armenia, Georgia, and Azerbaijan in the 1960s helped reduce the demand of energy from Armenia, and the construction of thermal powers started, due to the arrival of gas from Azerbaijan. The level of Lake Sevan had been reduced by 18 meters due to the loss of water and the surface had become 1,242 square kilometers (the Sevan island has become a peninsula due to this severe reduction), and a plan to solve the issue was put in place. As a result, the release of water was reduced to 500 million cubic meters per year, of which 380 million was intended for irrigation and the rest for reserve of the power system. Two steps of the Vorotan River cascade of hydroelectric stations were put into operation in 1978, and the generation of power from the lake was totally stopped. The Sevan-Hrazdan cascade was reconverted into an irrigation operation. This was not enough to stop the drainage of the lake water. For this reason, one priority was to divert to the lake an annual amount of 250 million cubic meters of water from the Arpa River, which would be enough, together with the lake’s own hydro resources, to stabilize its level. The construction of the Arpa-Sevan tunnel, which would ensure the flow of the river to the waters, was no small engineering feat. It would cross 49 kilometers (30 miles), drilling through the mountains that surrounded the lake. The tunnel was inaugurated on March 21, 1981. In 2010 the tunnel received the name of “Arpa-Sevan tunnel named after Hakob Zarobian,” in memory of the Armenian republican leader from 1960-1966 who had been instrumental in the construction of the tunnel. The tunnel during its reconstruction in 2004. However, it is important to note that, since the water level in the lake did not rise as fast and as much, a month later the Council of Ministers of the former Soviet Union passed a resolution to build the Vorotan-Arpa tunnel to complement the work already done. This second tunnel is 21.6 kilometers (almost 14 miles). The Karabagh conflict and the earthquake of 1988 halted the construction, which was later resumed. The tunnel was finally inaugurated on April 26, 2004, bringing an additional 165 million cubic meters to the lake annually. The water level of Lake Sevan began rising significantly after the second tunnel was completed. It was reported in 2007 that the water level had risen by 2.44 meters in the previous six years and reached 1900.04 meters in October 2010. The government committee on Sevan has predicted that it will reach 1903.5 by 2029. Last edited by Vrej1915; 09-25-2018, 11:10 PM. If you close the outflow of Arpa in Ketchut, you do not need a dam in Areni, the river will just dry; . Obviously you know what you are posting. I just don't want to see any drop of water go to the turks including Artsakh direction. See attached massive city they are building at the border by Terter. See the water we are offering them to make it happen. Drdu (Tartar) river you are mentioning here is virtually the only river flow we manage to control , more or less, regarding azarbaijan. Thanks to 2 major dams inherited from soviet period, the Sarsang dam and smaller Mataghis dam, give NKR control over the flow. Here on your google earth images, the river bed is virtually dried down. Now the modern city they are building less than 5 Km from the frontline is just a good way to waste money. Mortar fire will be enough at first occasion to create a new Akna. It is built on the ruins of our occupied town of Leninavan, in Martakert district.